As I continue my journey home from the medical tourism trade show in Mexicali – I am reminded of the urgency of the need for industry regulation. This reminder comes in the form, of a very nice Chinese woman in the Los Angeles Airport (LAX). 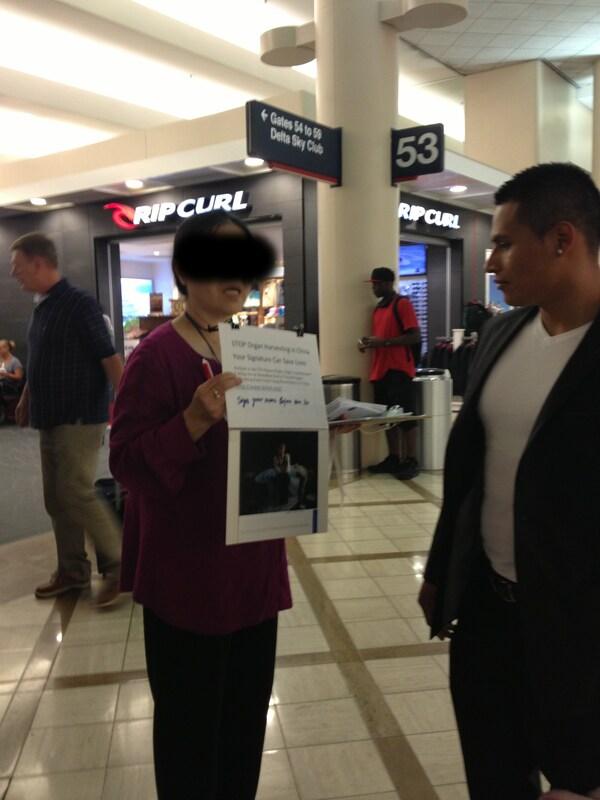 Now, in this photo she is talking to a traveler in the airport. Sadly, he seemed to think she was trying to sell him something, instead of merely enlisting his aid against human rights atrocities. (If you look close at the next photo, you can see her display). I have blurred her features to preserve her privacy and safety. 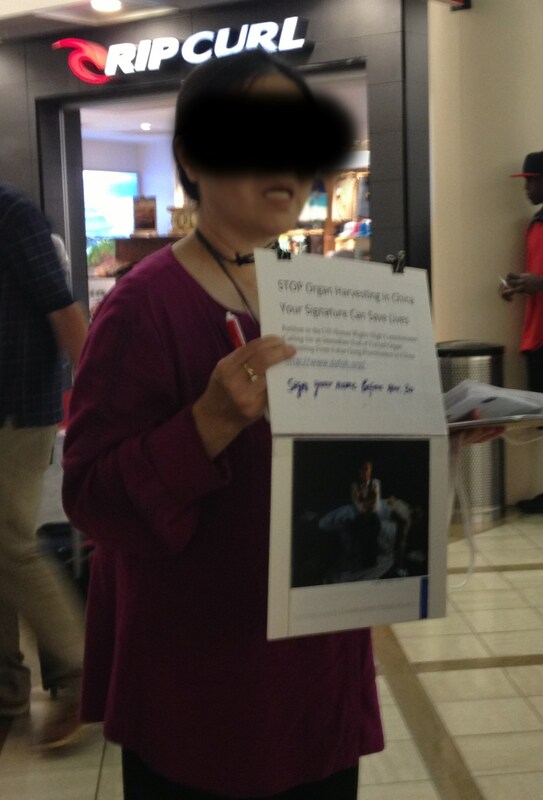 But now – on the heels of a gathering dedicated to the business side of medical tourism (with nary a consideration for ethics or the need to establish a moral compass) this woman, her brochures and her sign remind me, yet again – why it is important for readers, and medical travelers to be informed. But it’s not enough to be aware of the abuses and human rights violations. It’s important that we, as consumers, service providers and yes, even as a writer, not contribute to companies, practices or services that help support the routine execution of other human beings in our own pursuit of health. It is more than unethical – to me it is unthinkable. So sign the petitions, research the issue – and more importantly, research your medical tourism facilitators (travel agencies), and destinations. 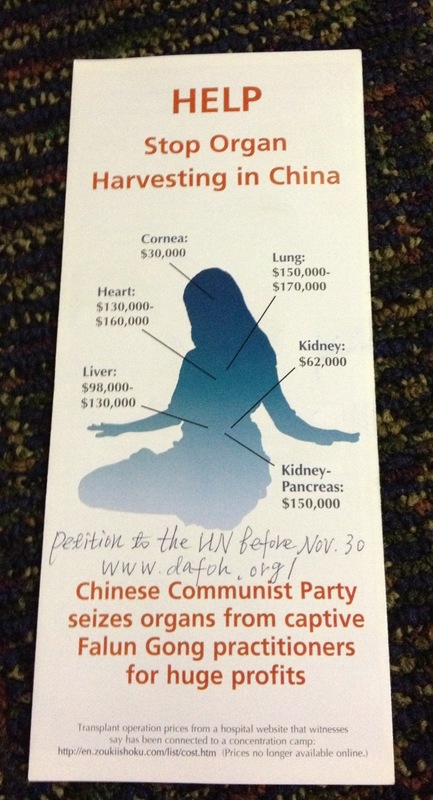 Most of all – don’t buy an organ – no matter what. This entry was posted in Uncategorized and tagged ethics, transplant tourism, UN resolution against illegal organ harbesting. Bookmark the permalink.